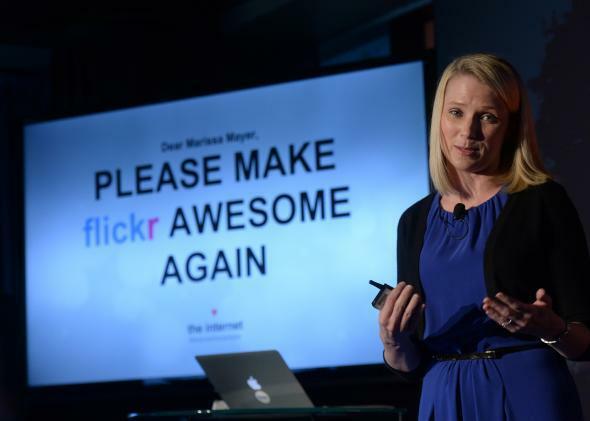 How Yahoo could make up for its decision to sell Flickr users' photos. Yahoo CEO Marissa Mayer speaks during an announcement that Yahoo acquired the Tumblr blogging site in order to upgrade its Flickr site, in New York, May 20, 2013. Every day, millions of people post their thoughts and pictures on Facebook and its Instagram subsidiary. Millions more post on Twitter, and Pinterest, and upload videos on YouTube—all participating in a modern ritual that enriches these third-party platforms while providing, in most cases, a satisfying experience to the uploaders. Apart from a few superstars who have special arrangements with these services, the contributors don’t get a cut. But when Flickr, the photo sharing service owned by Yahoo, decided to start selling pictures its users had uploaded—photos licensed by their creators for royalty-free commercial reuse—there was a sense that Yahoo had crossed some kind of line. It’s a somewhat complicated situation, but it highlights a longstanding unease in this arena. Are we getting a fair trade for what we so willingly give to these giant companies? Most people would say yes, but the digital world includes an evolving marketplace that has a long way to go before it reaches equilibrium. The Flickr case looks from here like mostly good intentions run awry. Flickr has picked images from its vast photo library and plans to monetize them by reselling “custom wall art”—excellent prints mounted on premium paper or canvas. Some photographers, selected by Flickr, will share revenues. So far, so good. What’s not so good: Many Flickr users who uploaded using a “Creative Commons” license—a copyright method that reserves only some rights, not all rights—won’t get a dime when their pictures are sold. Yahoo is reselling photos the users uploaded under a license often abbreviated as CC-BY (here’s a link to the latest version), which permits reuse as long as credit is given to the original artist. Yahoo has every legal right to do this. Still, it clearly rankles some people, though when the Wall Street Journal contacted 14 Flickr users whose work was included in the new offering, eight said it was fine with them. There are a couple of remedies for people who don’t like Flickr’s initiative. One is to remove pictures from the archive, and refrain from posting more. Another, for future uploads, is what I do when I post pictures at Flickr. I use a more restrictive Creative Commons license: CC-BY-NC. This means I’m freely licensing the picture for reuse by anyone, but only for noncommercial purposes. (I do the same with my books and my personal blogging.) So my photos aren’t in Flickr’s for-sale section, not that they’re interesting enough that anyone would want a large print in any event. Yahoo is being ham-handed here, no question. On a mail list I frequent, Nathan Matias, an MIT Ph.D. student, made one suggestion for how Yahoo could soften the indignation: “invite all purchasers of photographs to send a note of acknowledgment or appreciation to the photographer”—a thank-you note for the generosity demonstrated by donating the work to the public. Gratitude is a key element in the sharing/volunteer economy, as he also notes in a blog post. I’d go further and say Yahoo should voluntarily share the wealth across the board, unless the photographer declined. Yes, this would add administrative costs. But imagine the goodwill it would generate. Also imagine the goodwill the Huffington Post would have generated if it had shared just a couple of million dollars from the more than $300 million AOL paid for the site in 2011 with bloggers who’d posted for free and whose work had given the publication its early credibility. There was no legal obligation whatever to do this—the bloggers were told clearly that they weren’t getting paid—but even a relatively small financial nod in their direction would have been seen as a highly ethical move. Likewise, the people behind the Oculus Rift virtual-reality goggles, who sold the company to Facebook for $2 billion after members of the public crowdfunded the early development, might have offered something more than their hollow thanks to the people who donated via Kickstarter. Equity would have been impractical, and no one who contributes to a project via Kickstarter and other crowdfunding services should be confused about what they’re doing. But it’s hard to blame folks for feeling like they’d been used. It’s reasonable to have contempt for business models that run along these lines: You do the work, we’ll collect the money, and thank you very much. It’s unreasonable to expect every service to pay every user. But the Flickr mess is an invitation to rethink a lot of things in this digital age, including copyright and sharing and fundamental fairness. Someday, I hope to see a social service emerge that either is entirely decentralized—where the users quite literally own everything—or limits its financial investors’ returns on the principle that the users are also investors, of time and effort. Given modern norms and laws, I won’t hold my breath on that one.